Under Section 175(1) of Singapore’s Company Act, all locally-incorporated companies are required to hold their Annual General Meetings (AGMs) within 18 months after the incorporation. Then, subsequent AGMs must be held every calendar year and the interval between AGMs should not be more than 15 months. 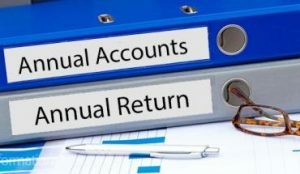 Additionally, ACRA mandates, under Section 197(1)(b) of the same Act, that such companies file their Annual Returns (ARs) to the Authority within one month after the AGM. It is also to be noted that Section 201(1) of the Companies Act requires the directors of the company to lay up-to-date accounts at the AGM. A grace period of 6 months (if it’s a non-listed company), for accounts updating, is given before the date of the AGM. ACRA says that this is important because “AGM provides shareholders with the opportunity to question the directors on the management and financial performance of the company”, and “AR provides critical information that helps the company’s stakeholders to make informed decisions”. But what if a company fails to hold its AGM or file Annual Return? In such cases, ACRA starts with a soft-line approach, progressing towards a more hard-line stance. Firstly, a penalty is imposed for late lodgement as prescribed in the Companies Act, Chapter 50. Then, in addition, summons may be issued against a company director for these breaches. 1) Companies may be offered an opportunity to pay a composition sum of $300 per breach instead of facing prosecution. Separately, a late lodgement fee is imposed at time of lodgement, for each AR that is lodged late. 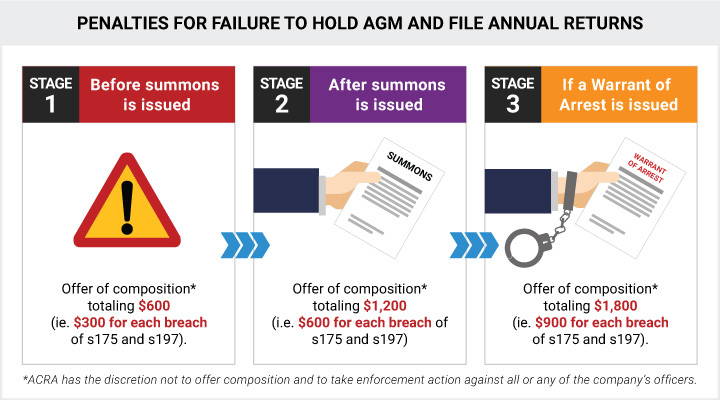 So while ACRA may also refuse if a director seeks to compound his breach(es) after a summons has been issued, the Authority can very well consider allowing him to compound by offering a composition sum of $600 per breach. And as noted above, this amount rises to $900 per breach after the director has failed to turn up in court to answer to his summons and the Court has issued a warrant for his arrest. 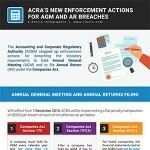 To learn more, view our infographic about new enforcement actions by ACRA for AGM and AR breaches to help you and your company stay compliant. Accounting and Corporate Regulatory Authority (ACRA) stepped up enforcement actions for breaching the statutory requirements to hold Annual General Meeting (AGM) and to file Annual Returns (AR) under the Companies Act. 3) Company directors also have the chance to make presentations to ACRA for reviewing summons, reducing composition sums, or late lodgement fees. The Authority may sometimes take eight weeks to reply depending on the complexities of the case. “A director or company secretary who defaults on the relevant requirement in the Singapore Companies Act for three or more continuous months may face a debarment order preventing them from taking any new such appointments,” informs ACRA. This will come along with another new enforcement power whereby a director who has at least 3 of his companies struck off within a period of 5 years (only applicable to striking off initiated by ACRA, voluntary striking off doesn’t count), can’t take similar position or be involved in the management of a company, for a period of five years from the date on which the third company was struck off. Need help with filing your Annual Returns or holding your Annual General Meetings? 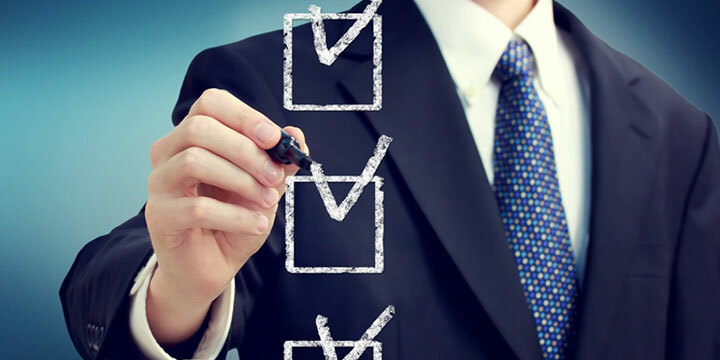 We can help you stay compliant with Singapore’s annual compliance requirements. Contact us now for a free consultation.